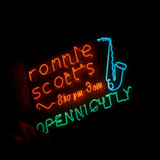 Ronnie´s presenting his latest album In Transit. This year DJ Yoda is bringing his latest collaborative project 'Home Cooking’ to the stage, welcoming some of his special guest contributors to join him on the tour of his new material. https://www... The Big Smoke Family. Jools Holland & his Rhythm & Blues Orchestra featuring Gilson Lavis with special guests Pauline Black & Arthur "Gaps" Hendrickson from The Selecter and guest vocalists Ruby Turner & Louise Marshall.